President Donald Trump went after NBA star LeBron James on Friday night after James did an interview with CNN’s Don Lemon. In an interview that aired last Monday, James and Lemon discussed James’ recent opening of a school for underprivileged children and politics. After Trump criticised Lemon’s and James’ intelligence, Lemon, CNN, and other NBA players took to Twitter to defend James. Twitter lit up with criticism against President Donald Trump after he took aim at NBA star LeBron James on Friday night. In an interview that aired on CNN last Monday, James and CNN host Don Lemon discussed politics and James’ recent opening of a school for underprivileged children. James, who has been critical of Trump in the past, said during the interview that Trump was using sports to sow divisions in the US. The president wrapped up the tweet by declaring, “I like Mike!” The statement was likely a reference to NBA legend Michael Jordan, James’ competitor in the debate over who the greatest NBA player of all time is. Trump’s tweet comes less than a week after James opened the school in his home town of Akron, Ohio. James said the school prioritises a holistic experience for students that include sports, which he described as critical for healthy communities. Many of James’ fellow supporters from the NBA leapt to his defence after the president took aim at him. Karl-Anthony Towns of the Minnesota Timberwolves told Trump to “stop using them twitter fingers” and focus on other matters of national importance. Utah jazz player Donovan Mitchell referred to Trump as an “insecure human being” and accused him of setting a bad example to the country. Lemon himself also chimed in and brought up the Trump administration’s widely criticised “zero tolerance” immigration policy that resulted in thousands of migrant families being separated, with many held in cages and detention centres. “Who’s the real dummy?” Lemon asked. CNN’s communications team referenced recent reports that Trump grew enraged when first lady Melania Trump watched CNN aboard Air Force One. It also tacked on the hashtag, “Be Best,” to its tweet. The hashtag is the slogan for the first lady’s childhood welfare initiative. Ohio Gov. John Kasich also backed James, including a statement disputing Trump’s vote on the greatest NBA player of all time. 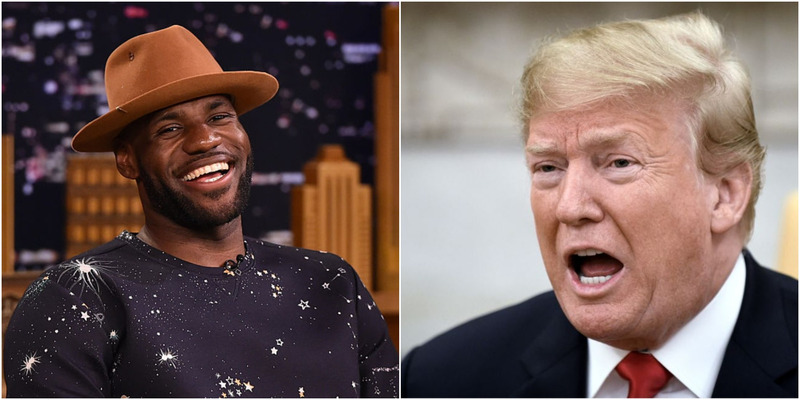 In one highly discussed tweet, James called Trump a “bum” and criticised him for deciding to rescind an invitation for the Golden State Warriors, the most recent NBA champions, to visit the White House. Trump rescinded the invite after Warriors point guard Stephen Curry said he would not go. But their relationship on Twitter hasn’t always been so fraught. Trump tweeted in 2013 to call James a “great guy” after he won 2013’s Athlete of the Year ESPY award.